The official unboxing for the next flagship killer Galaxy S8 is coming up and Samsung is making it sure to make record sales by pushing out regular updates to previous devices. We have already seen the official Nougat update released for a lot of Galaxy S7 devices and one of them were the Canadian variants. However, the top carriers from Canada, viz, Rogers and Telus were left out. Today, the country’s biggest carriers Rogers and Telus are pushing the Nougat sweetness to the Galaxy S7 with the model number (SM-G930W8) and Galaxy S7 Edge (SM-G935W8) in Canada. The OTA update is now live and for those who are already on the stock Marshmallow firmware will start receiving the latest firmware version G930W8VLU2BQB6 and G935W8VLU2BQB6 respectively. The update also comes with February 1, 2017, security patch level from AOSP. The Odin flashable files are also available and can be downloaded directly from the Samsung servers using our tutorial below. Moreover, we have also captured the full stock firmware files for the same from alternative servers. The package is available and can be downloaded from the download section given below. 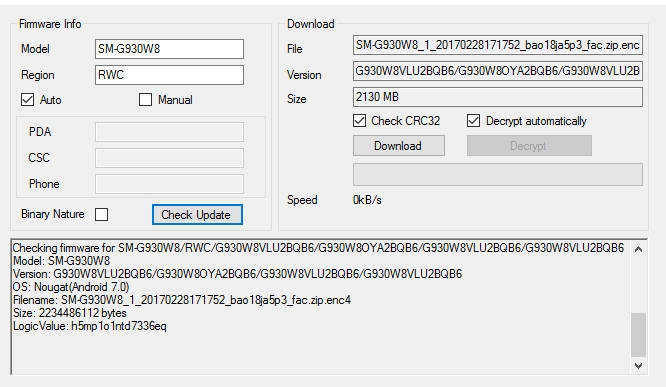 The best and safe way to download the full stock firmware file is to download it directly from Samsung servers. Yes, you don’t need to go through the hassle of subscribing to third-party website or speed or bandwidth limit while downloading. See how to download Galaxy S7 stock firmware directly from Samsung servers. See screenshot below. The following Android 7.0 Nougat builds are for Samsung Galaxy S7 (SM-G930W8) and S7 Edge Plus (SM-G935W8) Canadian variants Rogers and Telus with PDA G930W8VLU2BQB6 and CSC G930W8OYA2BQB6 for S7 and with PDA G935W8VLU2BQB6 and CSC G935W8OYA2BQB6 for Galaxy S7 edge. Security Patch Level 2017-03-01/March 3, 2017. In order to update the Canadian variants of Galaxy S7 and S7 edge to latest QB6 Nougat firmware, head over to this post that explains how to restore Samsung device to complete stock via Odin software.